If you are one of those people who likes to question everything… then this podcast is for you! 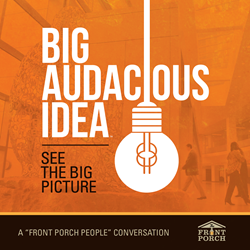 Front Porch Media is launching its newest show, Big Audacious Idea. The Front Porch Media Network (“Front Porch”) is launching its newest podcast Big Audacious Idea. If you are one of those people who likes to question everything… then this podcast is for you! Is reincarnation real? Is cryptocurrency just a trend? Will today’s technology steer us into a Renaissance or a Dark Age? Can time move backwards? Are we all connected? The show will dive into the “shower thoughts” of one’s mind with 35 minutes of big-name interviews, masterful storytelling and compelling podcast conversation. Big Audacious is the largest investment made into a podcast by Front Porch Media in the company’s history. Big Audacious Idea is a podcast for listeners who think boldly and beyond conventional perception. Host Craig James meets with many of today’s most provocative thinkers to explore the meta-questions of life. Its 35 minutes of deep and thoughtful discussion guaranteed to feed the curious nature of your mind. Each episode features “mind giants” like Seth Godin or Alan Burdick who examine what it means to be human, asking the questions that will lead to new discoveries for humankind. Listen to Big Audacious Idea for the questions that will spark the big ideas of tomorrow. Big Audacious Idea will debut on May 30th! To produce and distribute high quality storytelling that entertains, inspires and delights the intellectually curious and highly engaged listeners across digital, mobile and terrestrial broadcast platforms.